Sign up for a new subscription for S&G, pay by Direct Debit and get 50% off your first year’s subscription. April saw some epic cross-country flying in the UK, including three laps of a 500km and the first Standard Class glider to complete more than 1,000 declared kilometres. Read about these flights from Portmoak in the June/July issue of S&G, which also features more top tips on thermal centring. You can discover what it is like to fly Stemme’s S12, plus there is an eight-page report on the highlights of AERO 2017, including the HpH TwinShark. Why three laps of a 500km? With improving conditions and plenty of daylight, it would be rude not to, said John Williams (who has previously completed two laps of a 750km). On the same day in April, and also from Portmoak, Santiago Cervantes went round a 500km twice in his Discus – the first Standard Class glider to complete more than 1,000 declared kilometres in the UK. In the third part of an Ask the Coach series on solutions to thermal centring, Tony Cronshaw talks to coaches Bernard Eckey and Kevin Atkinson about the open-out-in-the-surge method. The rule is perplexingly opposite to the dig-into-the-surge method, so how can two apparently opposite methods succeed in centring and which one should we use? Having displayed the Stemme S10 at the 2015 AeroExpo, Guy Westgate jumped at the chance to fly Stemme’s S12 and to find out “how you make the world’s best side-by-side two-seat glider even better”. Stemme’s S12 and S10 flew in formation at Lasham at the end of last year, resulting in some stunning photography. Europe’s largest aviation fair, AERO, took place in Friedrichshafen, Germany, in April. This year was a ‘gliding year’ and one of the gliding stars of the show was the TwinShark from HpH. 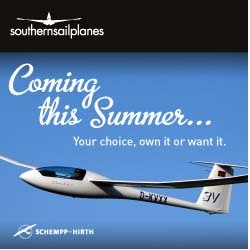 Available as self-launcher or sustainer, the 20m TwinShark competes with Schempp-Hirth’s Arcus and Schleicher’s ASG 32. The show is enormous and there was certainly plenty to attract the interest of UK glider pilots visiting Friedrichshafen this year. 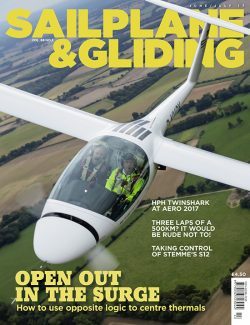 Also in this issue: Murray Stimson reports on the ‘Future of the Open Class’ debate, with a panel of some of the world’s leading authorities on glider design. David Innes comments on the impact of Deeside GC’s EuroFOX after the first six months. Mark Lawrence-Jones reflects on a Diamond flight that kept on giving. Lucy Wootton reports on the Junior Winter Series, with an account from Henry Inigo-Jones on his Silver distance. Richard Blackmore recalls his role in the TV gliding documentary, Riding the Summer Sun. Bernard Eckey researches the phenomenon of hydraulic jump. BGA development officer Alison Randle looks at the unintended consequences from skewed attitudes to risk at clubs. Lizzie Pike finds out why two new BIs became instructors and the impact it has had on their own skills and careers. 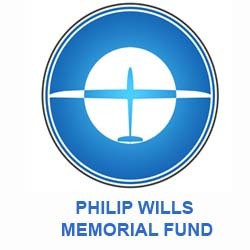 Colin Weyman has a cunning plan to obtain a longer lease at Eyres Field. Jez Hood reviews the second volume of G Dale’s The Soaring Engine. Pete Stratten provides an update on EASA regulatory developments. There are many more of your stunning images in the Gallery pages. And last, but not least, there’s the BGA club annual statistics. Why open out in the surge? What is future of Open Class?